Richard F. J. Arthur has sent this. Reg Bradshaw was a highly respected geologist with a long and distinguished career which began in 1948 at UCL. In 1958 he moved to Bristol University’s Geology Department. There he obtained a doctorate and became a senior member of staff, writing numerous scientific papers. A full account is being written elsewhere so I will restrict this to a personal tribute and to his connection with BNS and WEGA. Reg was my tutor at Bristol, and was inspirational in developing my passion for geology and interest in education. He was kind and considerate, very approachable, and consequently he was popular with students and staff. Like many others, I only ever knew him as Reg. Always the well dressed elder statesman (usually in a tweed jacket) but with the energy of a teenager and a dry sense of humor and, confirmed by his family, a slightly mischievous character. That boundless energy, enthusiasm for life and twinkle in his eye, never left him. 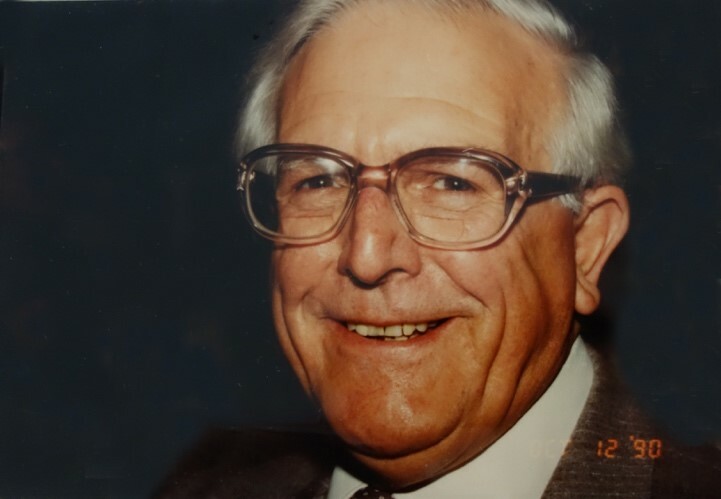 The current Prof, Mike Benton, told me that Reg was before his time but wrote “I met Reg a few times and was most impressed by his activity especially when we had our Adult education programmes”. Reg felt the University should be a nurturing environment and a community, and not just a seat of excellence. He also saw the value of taking geology to a much wider audience, and like many of the Geology Department staff he was a regular at meetings of the Bristol Naturalists Society and wrote many papers for the BNS proceedings. He was very active in BNS and joined a long list of presidents who, right from the societies foundation in 1862, were also geologists. In addition to his research and teaching load, he took many extramural courses and field trips. When these became ever popular, a regional branch of the Geologists Association (WEGA) was set up in 1976 – As I write this Reg is still listed as their President. The then Prof - David Dinley (unable to be at the funeral through lack of mobility) give permission for WEGA to join BNS in being able to use departmental lecture theatres – thus both societies have longstanding links to the University and continue to utilise rooms for meetings – Sadly in the current economic atmosphere it does not seem possible for the university to support any extramural geology courses. Reg’s spent a lot of time in Norway and Connemara on his main research interest - metamorphism and crystallography. However, he was very much from a generation of scientists who also saw the need to study geology as a whole and not in overly specialised compartments. Some 25 years ago, he chaired a conference ‘earth science takes over from geology’ where he seemed to back my belief that such changes would not necessarily be for the better. Reg helped me choose my independent mapping area and when the metamorphic rocks turned out to be fiendishly complex, allowed me to simplify the petrology concentrating on the structural relationships instead. Little did I realise then how much this would turn out to be due to the new fangled Plate Tectonics. Back then students made their own thin sections and did a lot of field work, something Reg believed was essential to make a proper geologist. He was also a great help in my early career and I felt he was the good friend I could always turn to for help. On my frequent returns to the department after graduating in 1975 he always made me feel very welcome. He facilitated access to the departmental library in the days when reference books were vital. Now in these days of turning to dubious IT such as Wikipedia they still are! Reg embraced technology, and even back in the early 1970’s I was told that the Geology Department was the main user of the mainframe computer, which then took up a whole building - undoubtedly his research required a lot of number crunching. Reg was an absolute whizz with the polarizing microscope, which he tried to teach me to use. I found it fascinating but hard not to be distracted by the pleasing play of colours. He was also from a time when geology maps were beautifully coloured. He helped me to be able to interpret them in 4 dimensions using the consistent logical colour scheme, evolved from William Smith’s map. So when the department was changing over to the modern ugly and illogically coloured versions, Reg asked if I would like some, needless to say I still display them. Reg enjoyed a long active retirement where he became a key figure in the local community and his church. He was still street collecting for charity in his 90’s. At the funeral, his colleague Brian Williams told us, that when the university was trying to decide which of two new members of staff to employ, Reg and another senior member of staff, Doug Hamilton decided to go part time so that both could be taken on. Due to this generosity Derek Briggs and a fellow graduate of my year Paul Wright joined the department, incidentally both are now professors. Paul told me he was sad to be abroad as he really wanted to attend the funeral. Brian Williams and Doug Robinson together then talked fondly of the trips they went on with Reg, but also hinted at a series of stories about his more playful side! Other fellow member of staff present included Bernard Leake, David Speedyman, Liz Loeffler and Dave Roberts. The church was full with family and friends, colleagues and past students - all all of whom sung his praises, saying how much they liked and respected him. I discovered from his son that Reg had been taken into Hospital but it was not a serious problem, so it was a tremendous shock when I was told Reg had contracted an infection and died peacefully just a few days after being admitted. A great loss to friends, family and to geology.